A third medal, the John Campbell Miles Medal was jointly initiated by the Queensland Division of the Geological Society of Australia and the Queensland Division of the Australian Institute of Geoscientistsand is awarded to those individuals who have made significant contributions to the advancement of economic geology, mineral systems, exploration technology or the discovery of a significant mineral or energy resource in Queensland. 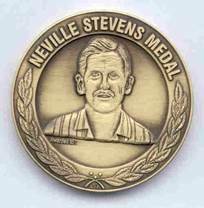 Separate guidelines are associated with awarding the Dorothy Hill Medal, Neville Stevens Medal and John Campbell Miles Medal. To read more about the criteria needed for medal nominations, please click here. Click on the winners names to read their nominations and responses.